While voters are decrying “politics as usual,” there’s little evidence that the game has changed. Sure, an inordinate number of incumbents found themselves on the losing end of the ballot on election day, but the Texas Legislative session pre-game show sure feels like same old, same old. Before the final ballots were counted, groups from around the state were quickly mobilizing to influence the election of the Speaker of the House. The Texas Constitution says, “The House of Representatives shall, when it first assembles, organize temporarily, and thereupon proceed to the election of a Speaker from its own members.” For such a seemingly innocuous charge, we’ve certainly seen a lot of activity. So what’s all the fuss about? POWER and CONTROL: what it’s always about. It seems we’ve forgotten the importance of debate and of seeking the wisdom of the assembly. We’ve been more inclined to choose and suffer under leaders who, while they may share the majority’s philosophical ideals, without a requirement for justice, wield the power of the gavel as an iron fist. I know this might come as a surprise, but 99 Republican representatives conveys a sizeable Republican majority in the Texas House. Here’s another one for you: those Republicans won’t always agree on legislative agendas. In order for us to enjoy the equal representation a free people deserve, we’ll need a leader that is first and foremost just! Yes, the various legislative ratings and scorecards give some indication of political philosophy but ideology alone is a poor substitute for justice. As we’re studying the attributes of each of the candidates for Speaker of the House, let’s give an eye to justice. Will the candidate administer the tasks[v] of the Speaker in a fair and just manner? And, probably most challenging of all, will they refrain from back room deals and special favors to those who have donated to their war chest? [v] For a listing of the duties of a presiding officer, refer to page 433-435 of Robert’s Rules of Order. 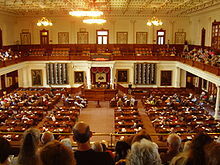 In addition, the Texas House of Representatives will adopt its own rules at the start of the session.